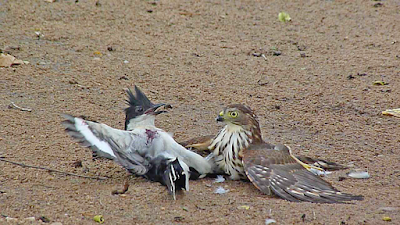 This Sparrowhawk did not let his cuckoo counterpart get off lightly in this battle of the birds and at one stage the feathers were literally flying….31-year-old, Organ Sabiepark, who works at Sabie Park just outside the Paul Kruger Gate, was able to capture this moment on film. Organ tells us: “I have the best job in the entire world! 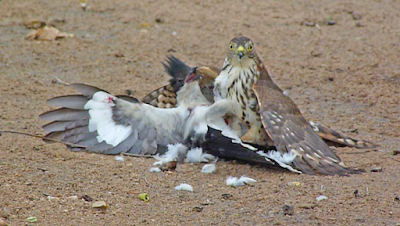 Getting to spend the whole day being with animals, there is nothing like it'.This was the first time I’ve seen an eagle killing anything.I was working at the picnic site, as usual, when I heard a noise coming from nearby. I started looking around and suddenly spotted the Sparrowhawk strangling a Jacobin Cuckoo. When I watched the sighting play itself out, I felt sad about what was happening! 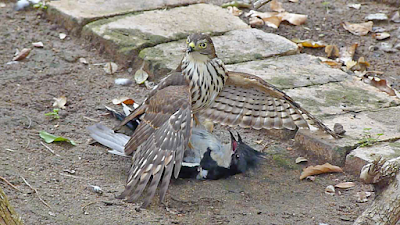 The Sparrowhawk was biting the Jacobin Cuckoo and trying to kill it, all while the cuckoo was fighting for its life and trying to escape.At the end, after fighting extremely long and hard, the Cuckoo managed to get away. That was in some way a great relief.”Sparrowhawks rely on the element of surprise and as such will often follow a regular route to get close topotential prey.